Community health and well-being requires a wide range of services and facilities, not just healthcare; and in recent years community infrastructure planning has become a much more integral part of the planning process. HUDU was an early advocate of community (or social) infrastructure planning and developed the Social Infrastructure Framework (SIF) toolkit to help health authorities and other organisations assess their infrastructure needs and look at a range of options for meeting them, including pooling of resources to make better use of public sector assets. 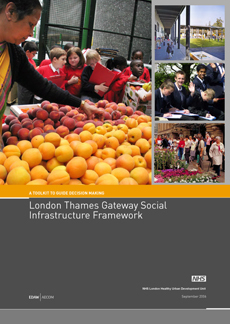 SIF helps to work out what social infrastructure from these sectors is needed for new and existing communities and where, when and how to best provide it to maximise the benefits and minimise the costs. It addresses existing deficiencies and geographic disparities and assists the production of Infrastructure and Local Plans.